Join Pól Ó Conghaile for an access-all-areas tour of Ryanair's HQ and flight operations hub in Dublin. Ryanair is rarely out of the news. And with 1,600 flights a day across Europe, it's rarely out of the skies, either. But where is this gigantic operation run from? What do its offices look like, how advanced is the operations hub that monitors its planes in the air, and do employees really play fussball in their free time? Watch this week's TRAVEL TV for the answers. 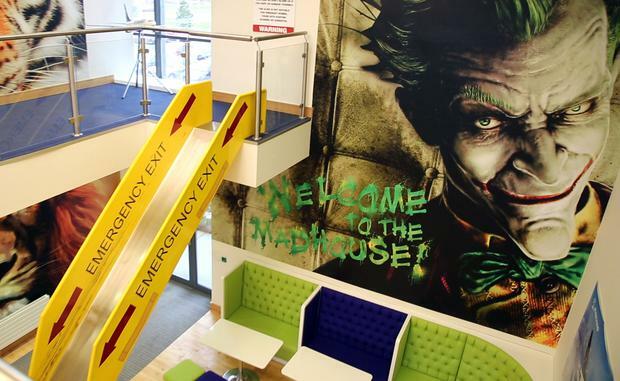 We think you'll be surprised at the Google-style colours, "labs", layouts and games rooms... not to mention the emergency exit. Oh, and then there's Michael O'Leary's office. Where does the controversial CEO work? And which of his horses is plastered in an oversized image on his wall? 500 staff, 1,600 flights a day, 100 million passengers a year. It's all controlled from here, and Independent Travel has an exclusive tour. Ryanair's HQ in Dublin. A slide connects the first floor to the lobby. 'Welcome to the Madhouse' reads the poster on the wall.